With whole grains, mixed berries, and fresh ginger, this breakfast oat smoothie is a delicious way to start the day! Happy Spring! Though we are still enjoying chilly mornings, spring is here and it’s time to lighten things up. I actually made this smoothie back in February for heart month but never got around to posting it. I made a few tweaks and because it’s so pretty, I decided now is as good a time as any to share the recipe. Heart health is something we all need to keep top of mind so… I’m sharing a recipe to nourish your heart and delight your tastebuds. This time of year you might still be looking for recipes for weight loss or just general healthy eating with summer on the horizon. 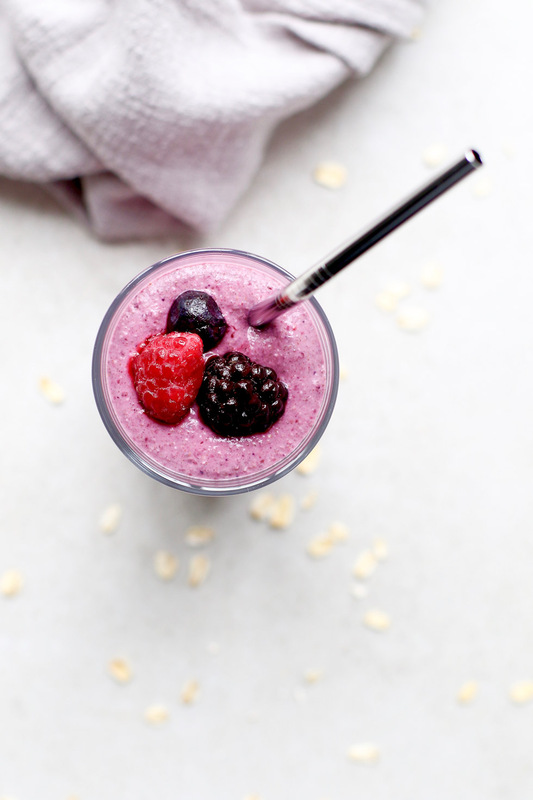 This Triple Berry Oat Smoothie makes it easy. It’s packed with fiber, heart-healthy oats, better-for-you fats from hemp seeds, antioxidant-rich berries. It’s also full of flavor and did you see that color? This recipe checks the box on heart health because oats contain a soluble fiber called beta-glucan which may help lower cholesterol. When eaten as part of a heart-healthy diet, eating 3 grams of soluble oat fiber per day may help reduce the risk of heart disease. A serving of oats has 2 grams. So with this recipe, you’re almost there! 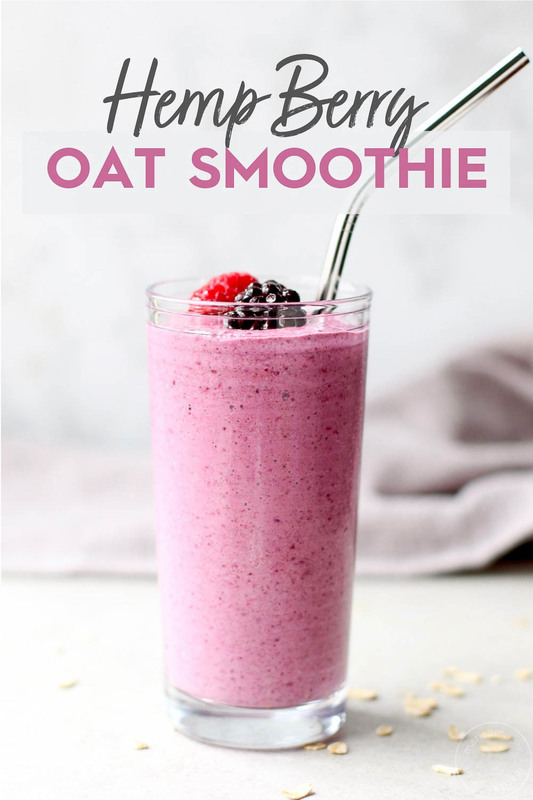 To make this oat smoothie, you’ll need a blender that can grind oats. There’s a lot that you can do with oat flour beyond adding it to smoothies, like adding it to baked goods, or using it as a binder for veggie burgers. But that’s for another day. It wasn’t until a few years ago that I discovered the idea of adding oats to smoothies. 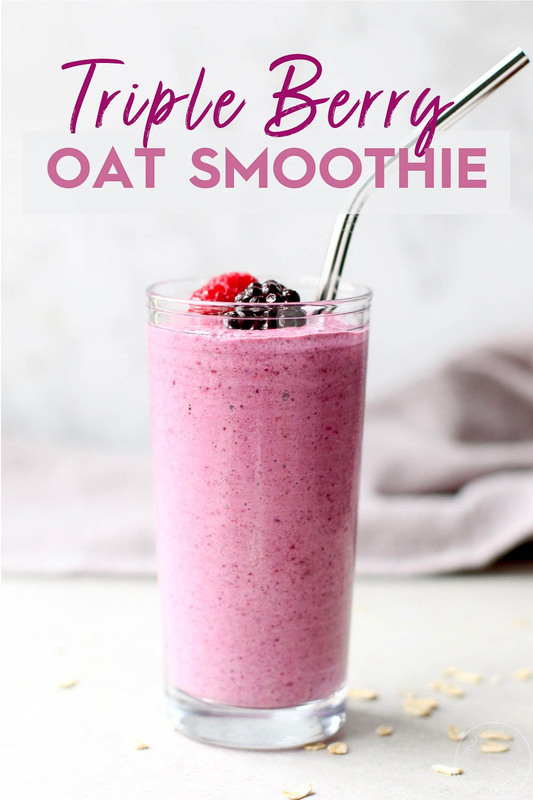 While I love my bowl of oats, adding oats to smoothies is an easy way to take them on the go. And it’s a nice way to enjoy them cool during the warm weather months. The hemp seed delivers protein without any protein powders or dairy. And you won’t even know they are there. You can use any mixture of frozen blueberries, blackberries, raspberries, or strawberries. And yes. Buy frozen. 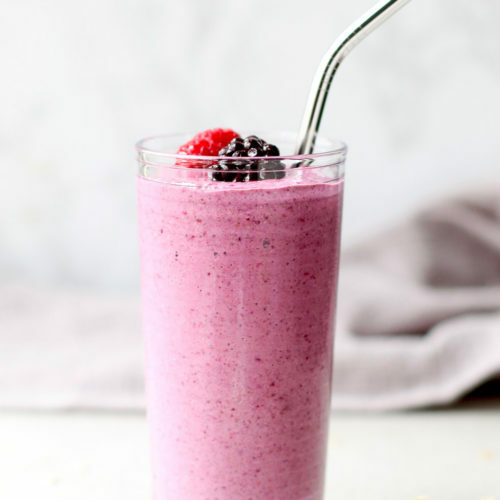 Frozen berries are inexpensive, nutritious, easy to find all year long, and help keep this smoothie frosty and refreshing. If you’ve been following along for a while, you know I tend to go light on sugar. I just like things less sweet. I’m using dates to add natural sweetness while also providing fiber, magnesium versus straight sugar – provides a few nutrient benefits for the sweetness. Added sugar doesn’t always come up in heart health discussions but they do play a major role. 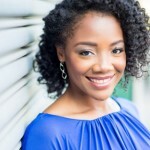 As a registered dietitian nutritionist, my job is to not only provide you with delicious recipes but also to educate. The American Heart Association recommends limiting added sugars to no more than six teaspoons (about 100 calories) per day for women. Because sugars can add up quickly, balance out the rest of your day by limiting other sugar sources. When creating your own smoothies, think about ways to use berries, and even spices like cinnamon to add flavor while keeping added sugar at a minimum. Now on to the super simple recipe. Be sure to tag me on Instagram when you make it. Packed with whole grain oats, hemp seeds, and sweet berries and dates, this breakfast smoothie is a delicious and satisfying way to get your morning oats! Add the ingredients to a high powered blender* in the order listed. Blend until smooth - about 30 seconds.